Help make the 2019 conference memorable. The ACM SIGUCCS 2019 Call for Proposals is now closed. Authors and presenters will be notified of their acceptance in early April. 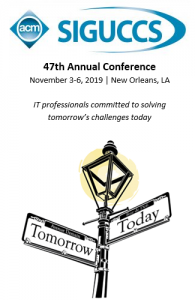 What topics will ACM SIGUCCS 2019 conference feature? If my proposal is selected, where can I get help with preparing for my presentation? Melissa Doernte shares how you can present a SIGUCCS conference poster in 7 easy steps. Kathy Fletcher shares her tips for giving a successful SIGUCCS conference lightning talk. Learn about SIGUCCS conference panel presentations. Are you overwhelmed by the conference paper requirement? Fear not! Learn how the paper writing process helps you!